Letting someone know they’ve won your contest or giveaway can be the most fun part of the whole “contest” experience. After all, you get to deliver exciting news! But if you haven’t planned ahead, wrapping up a contest and picking a winner can also be kind of stressful. Awarding a contest entry based on a “Share” breaks Facebook Policy, so there actually isn’t a legitimate way to choose a winner this way. Knowing my response will leave this person scrambling for a plan B makes me feel even worse, especially because I know it’s avoidable. If I could reach all of these people during the planning stage of their contest, I’d give them one simple piece of advice: work backward. In other words, determine the outcomes you’re looking for first, and then decide how your contest can help you get there. What is my end goal for this contest/giveaway? Is what I’m looking to do possible? How will I choose my winner? This works for a giveaway when you’d like to choose one or more winners from a pool of entries. 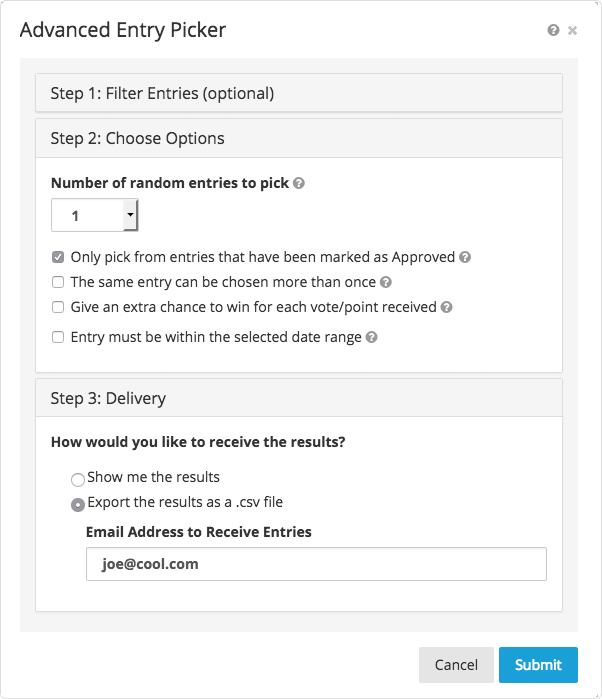 Many online contest builders offer a means of choosing a winner at random but if you use ShortStack, go into your database of entries and click the “Pick Random Entries” button. Then choose the number of winners you’d like to award. There are also free services you can use to select random winners such as random.org. This method may be about as simple as it can get. Create a post, and choose from the comments people leave. 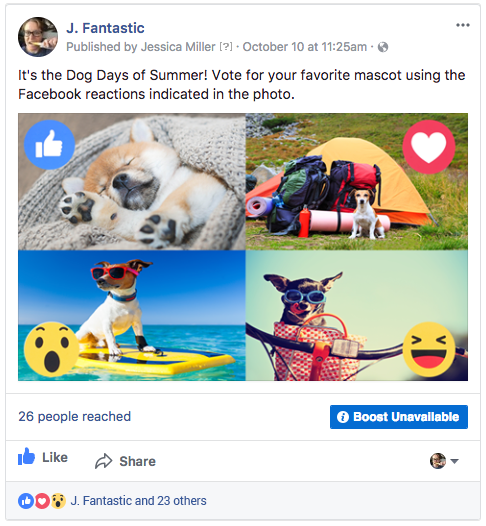 A couple of clever twists for this type of contest up would be to 1), allow other participants to vote on their favorite comment using different Facebook reactions, or 2), to respond with a “Like” on the comment they want to see win. 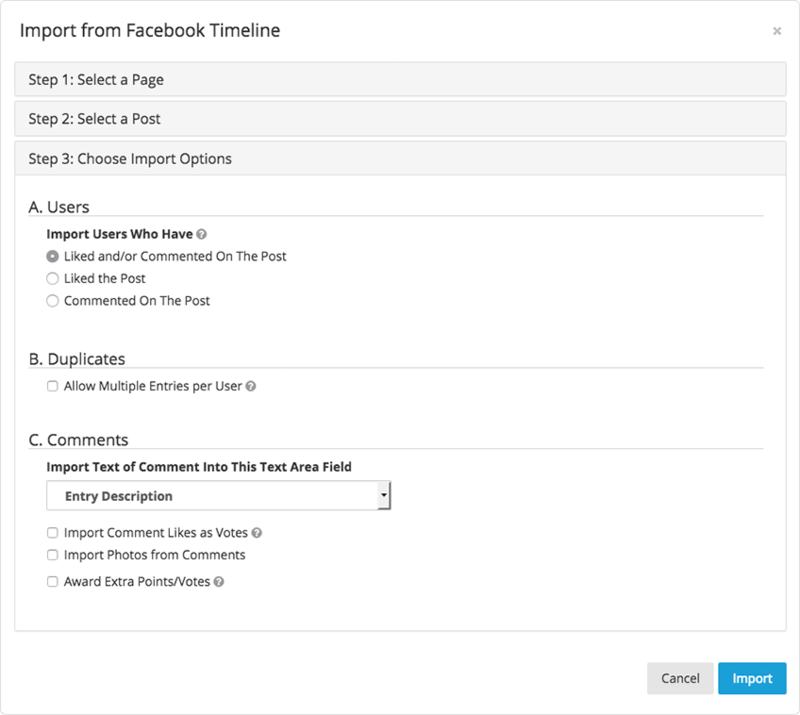 Once again, you can use ShortStack to import into a database all the people who commented and/or liked your post. From here, use the “Pick Random Entries” feature to select a winner at random. By the way, it’s a best practice to let people know from the beginning how you’ll choose a winner by spelling it out in your contest rules or terms and conditions. This assures people your contest is being run fairly. 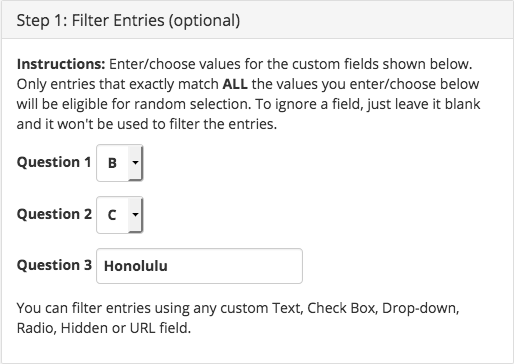 If your contest includes an entry form, you can filter entries by a specific value for each of your form’s custom fields. This is a great way to choose a winner if you are running a quiz. Filter your database of entries to only show the entries that selected a specific value in a drop down menu. In ShortStack, this can be done in the “Pick Random Entries” menu by selecting the “Filter” option. Then, award everyone who answered all of the questions correctly, or select a winner at random from only those who answered correctly. Voting contests are hugely popular because they’re fun, and typically when people submit an entry, they’ll work hard to drive traffic to your contest and earn themselves more votes. The winner in this case may seem obvious: “The highest number of votes wins.” However, you may want to build some stipulations into your contest juuuust in case anyone who enters suspects cheating. Add some verbiage to your terms and conditions saying that the top 10 vote-getters will be in a final round, but ultimately the winner may be chosen by a panel of judges, or by the contest administrator. When planning your online contest, spend some time thinking about the details, such as how you’ll choose a winner, before you start designing the contest. Consider giving a little thought to a few other components, too, including the prize(s) you’ll offer and what to include in your contest rules. In the long run you’ll save yourself some headaches and be able to focus on the fun and think about how you’ll use all the amazing leads you collect.